It’s Friday, and after last week’s rib debacle, my expectations for this week’s recipe were high. Roasted rhubarb was on the menu for French Fridays at Dorie. I have a patch of rhubarb growing in my garden. When I went out to pick some, I noticed that it’s a bit overrun with raspberry volunteers, so some weeding is in order. 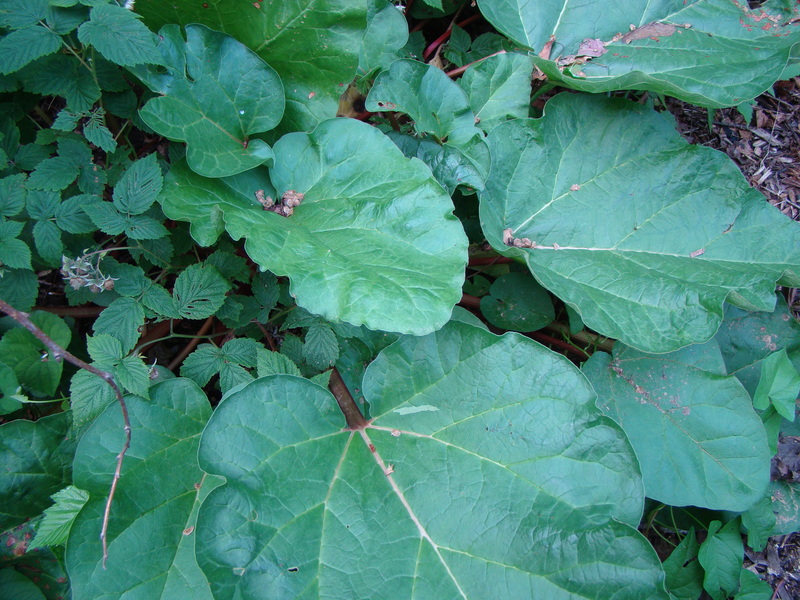 The plant has enormous, platter-sized leaves, which are quite poisonous due to oxalic acid. Fortunately, the stalks are safe to eat. I do love rhubarb. Usually, I stew it or make a rhubarb crisp with lots of sweet crumbly topping. I had never tried roasting. This was a simple and satisfying preparation. Low effort yielded delicious results. 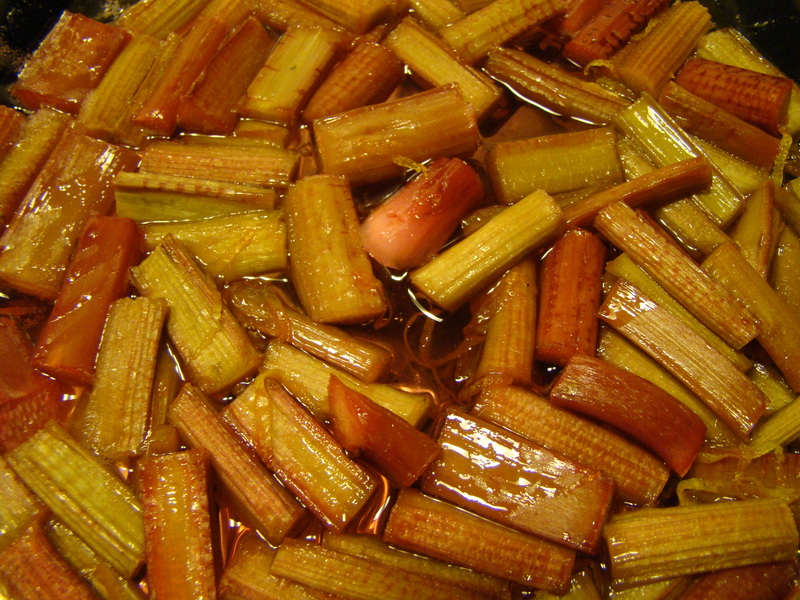 Rhubarb pieces were mixed with sugar and lemon zest and then roasted until soft. I love the contrast of the tart fruit and the sweet light pink syrup created during the roasting process. This was a definitely a success! It makes up for last week. I ate it both plain and with some thick Greek yogurt for breakfast, though I preferred with yogurt. I don’t like anything too too sweet in the morning, so this was perfect, especially with my new favorite brand of Greek yogurt (Cabot). I made only half a recipe because I wasn’t sure how it would come out, but I am already thinking of variations for next time. For one thing, I think I’ll cut the pieces a little smaller as I found they were a little big for the spoon. I also think that grated ginger would make a lovely substitute for the lemon zest, maybe even with some chopped crystallized ginger too. If you’re new to my blog, every Friday I cook a new recipe from Dorie Greenspan’s newest cookbook, Around My French Table as part of French Fridays with Dorie. Lots of other bloggers do it too. The great fun is reading their posts and comparing notes. You can see what my fellow FFwD bloggers thought about this week’s recipe. Check out their links here. We don’t post the recipes, but consider getting your own copy of the book. Maybe you’ll even want to cook along with us on Fridays. Posted on 17 June 2011, in French Fridays with Dorie, Gardening and tagged French Fridays with Dorie, rhubarb. Bookmark the permalink. 21 Comments. 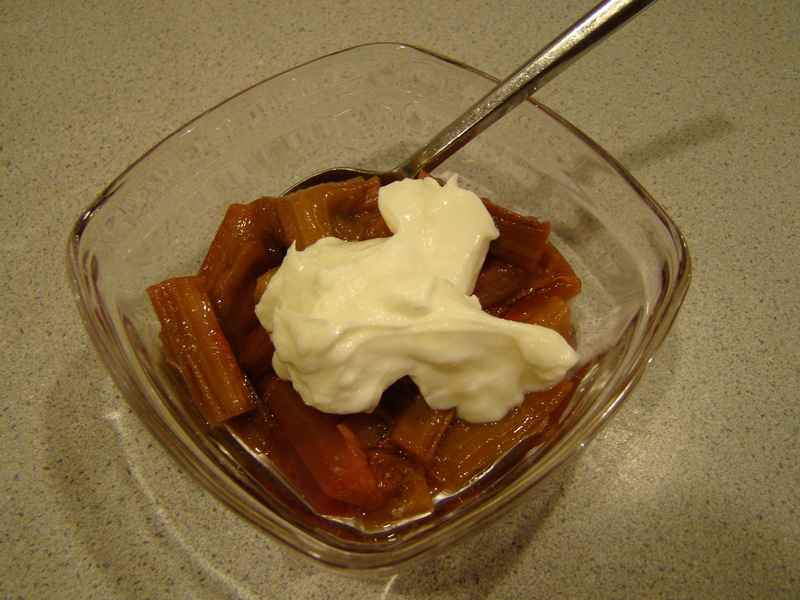 Betsy, Your rhubarb looks wonderful…I’m so jealous…mine looked more stewed. The pieces broke down but the deliciousness was a ten plus. It was great over ice cream! Lovely photos! Enjoy your week-end! I love that you have a rhubarb patch! (I really need to go ahead and transplant some and stop stealing all of my parents rhubarb). Glad this week was a success! I love your rhubarb patch! I’m glad you found a new and easy way to prepare it – they only way I’d ever had it before was in a bake good, and I pretty much did the same with this, but we loved it, too. I had to sit out this week because I had no rhubarb. I’m so tempted to get some seeds and try to grow a little patch! So great that you had your own rhubarb that you could use! Ginger sounds like a great idea. I added a little bit of cinnamon to mine too. Lucky, you with such a bountiful crop! And great idea for breakfast! Your own rhubarb patch ? Can Nana and I stop by – she has been to 5 different stores today alone trying to find me more rhubarb so we can figure out how I screwed this one up :) I am definitely going to make this again – something went awry but there are too many yummy rhubarb recipes and success stories for me to give up. Great post. Oh, I bet it tasted so much better since it was from your very own garden! How fabulous, Betsy. Yes, I loved it with the lemon zest, but I want to try the orange zest next time. I think this is a perfect topping for just about anything! Have a wonderful weekend! How lucky you are to have a rhubarb patch! Glad you found a new way to enjoy your rhubarb. I am so impressed that you have a rhubarb patch! And your photos look great! I’ve always wanted to plant something, anything. But in between houses at the moment as we are about to start building a new house. Can’t wait to move in and try planting! Looks incredibly satisfying! So great that you have a rhubarb patch. Now that I’ve tried rhubarb and I liked it, I might just have to plant my own rhubarb patch. I wish I had rhubarb in my backyard. I should plant some next year. I was soo disappointed that I could not join in this week because I love rhubarb! I would have probably mixed it up with yogurt just like you…that sounds really really good. How wonderful that you have rhubarb growing in your garden. I’m on a hunt to find some good, fresh rhubarb. I’m in the mood to do more with it, especially after reading this week’s posts. This is an overlooked vegetable and I’m surprised by how many Phoenix folks have never heard of it or tasted it in any form…especially the young people. Enjoyed your post and happy for your success. Your rhubarb plant is great! I don’t know that having raspberries sneaking in there is too terrible a thing – at least at harvest time! Love your idea for ginger – sounds like a great variation to try. I think the crystallized ginger sounds divine. It’s sort of overlooked in the kitchen… but really adds a unique flavor. Be sure to post if you try it out. …and thanks for the Greek yogurt shout out. Our farm family owners appreciate the support! I really love my rhubarb patch, too. It’s so lovely to be able to walk outside and get fresh food. I really liked this recipe – the texture is a nice change from stewed and the flavour of the syrup is amazing. I used a pinch of cinnamon with the lemon zest and sugar, but using ginger would be an amazing variation. I’m jealous of your rhubarb patch. I had to buy mine at the store. Yes, I think it definitely depends on how fresh your rhubarb is – mine from the green grocer fell apart and was more like stewed than the lovely, firm pieces you got. It was still delicious, mind you, so I wasn’t too upset with the texture! I’d love to try this with yogurt and homemade granola one day. Looks delicious with the Greek yogurt! I think I’m going to have to get myself a rhubarb patch so I can make this every year.